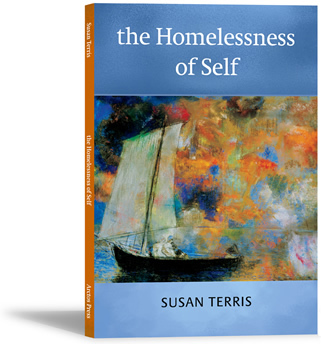 Poem by Susan Terris from "the Homelessness of Self." And sea pearls wash ashore. Whine. Shape-shift in an ocean cave. Where sand and stars intermingle. So struggle. What's left won't be saved. Abrade, return to grains of sand. Susan Terris teases out the terror of the everyday, the elegies for all our lost selves. And yet, in their immense range and variety, their wildness and dangerousness, these poems are finally suffused with poignancy and compassion. Susan Terris is a true original, a remarkable, remarkable poet. As the whorls of a fingerprint mark a singular identity, so with the poems of Susan Terris, whose twisting, whirling lines trace the dissolving trail of a restless self, obsessed, unmoored, "lines of uncertainty arrowing off in all directions." Hers is a stinging insight, a high energy, diamond-hard compression; a mind unsatisfied, meteoric, myth-seeking, voicing our contemporary "age of un-innocence," unable to believe in what it needs. "Sometimes safety is unbearable," declares one of these sharp, and sharpened, poems — it's a theme that informs the whole collection, as its many voices, all equally sure, equally exacting and precise, take stock of the real situation of the women Terris sees around her. In her intimate social examination, Terris also does something entirely new with the confessional poem, opening it to previously unexplored territory with her vivid, idiosyncratic language and hauntingly honest imagery. The whole is eye-opening and refreshingly frank.